One of my husband's wish is to have a heavy duty floor mat for our garage. The concrete floor right now have some cracks, the result of the house still settling in due to its brand new construction. The builder had the cracks sealed and so the husband wanted to cover it up with a custom made floor mats that will not only protect the floor but also to make the garage less cold during winter time. One of our neighbors have custom made mats for their garage and we thought it is a good one. I think they had it installed from one of the home stores in our area. Maybe this will be my next project to surprise the husband. Another on his wish list with regards to sprucing up the garage is to paint it. Three gallons of paint will be needed for it so it will be an inexpensive project to tackle later on. I bet it looks nice to have a nice floor mat in your garage with a nice patterns too. My husband used to have this kind of mat in his old place. I did not care much for it, but I must say it was pretty good keeping the garage warm during winter. I want something like this in our basement and garage too. 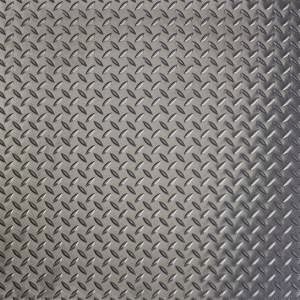 This look thick, and durable and indeed perfect for garage floor mat.